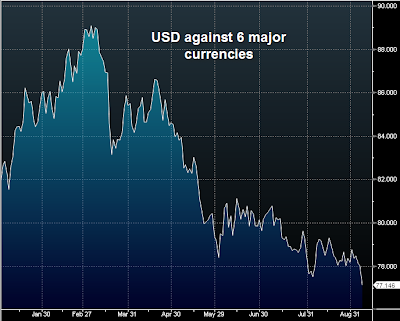 With all the talk about an alternate reserve currency, the dollar is taking a pounding. 1. Russia: With their economy in shambles and completely dependent on energy exports, Russia wants a weaker dollar in order to raise energy prices. Oil price is up $3.50 (5%) a barrel this morning on weak dollar. 2. China: China's currency is pegged to the dollar, so a weaker dollar makes their goods cheaper in Europe, Japan, Australia, etc. 3. OPEC nations: the same reason as Russia, recreating a 2008-style spike in oil prices. Oil prices tend to be momentum driven and if one can get the rally started, the price can overshoot the fundamentals. 4. Australia and South Africa: Similar reasons but driven by industrial metals and gold (in the case of South Africa). Copper and gold have spiked this morning in response to weak dollar. In the US, exporters large and small are interested in a weaker dollar to make their goods cheaper abroad. Some large US firms with significant earnings abroad want to inflate their non-USD earnings abroad (when translated into dollars.) Of course the US and international energy firms like the weak dollar as well to try to recreate the earnings bliss of 2008. And as long as US rates stay near zero and all the government easing is injecting new dollars into the system, the dollar will keep taking a beating - in large part because so many want for it to happen.